The perfectionist's kit for leather interiors! Increase your driving enjoyment with an interior that is clean, protected, and well maintained - scented with just a hint of tropical fragrance. The Pinnacle Concours Interior Kit will give you the products and tools to take your vehicle’s interior from dry and dull to rich, supple, and luxurious! Leather & Vinyl Cleaner will remove just about any stain from leather and vinyl. Natural citrus cleaners penetrate deep into every pore to gently lift out dirt, grease and oils. The toughest stains wipe away leaving only a fresh lemon scent. Pinnacle Vinyl & Rubber Protectant beautifies and protects your car’s dash, vinyl seats, and door facings. The blend of natural and modern ingredients restores the natural sheen of vinyl without that artificial plastic look. Surfaces are enhanced to a non-greasy, satin luster. Conditioning oils of vanilla and banana provide a fresh, tropical fragrance. 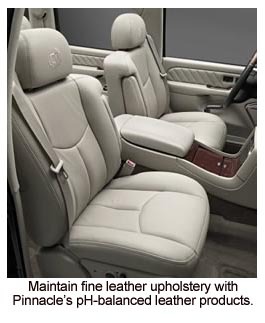 Pinnacle Leather Conditioner nourishes leather with a rich formula of lanolin and natural oils. These oils quickly absorb into the hide leaving a non-greasy, satin finish that actually repels dirt and moisture. A subtle fragrance compliments the leather’s natural aroma. Use this brush to remove deep down dirt and stains from vinyl and leather. Yes, you can scrub these materials and get impressive results. Get a secure grip with this multi-use wood handled hand brush. Also known as our "Auto Vent Brush". Use this long bristled brush to clean vents, speaker covers and all dashboard controls. Get into all those dust collecting nooks and crannies! These applicator pads are perfect for applying the products included in this kit. Soft, absorbent microfiber is wrapped around foam pads. The microfiber will collect dust as it spreads a thin, even coat of products. Want to know how to really do it right? Follow these step-by-step directions provided by Pinnacle Products. A $127.89 VALUE. SAVE $27.90!